Persistence Market Research offers a 10-year forecast of the global citrus oils market between 2017 and 2027 through its recently published report titled “Citrus Oils Market: Global Industry Analysis and Forecast 2017–2027.” The primary objective of the report is to offer insights on the advancements in the global citrus oils market. The study demonstrates market dynamics that are expected to influence the current environment and future status of the global citrus oils market over the forecast period. The other objectives of this report are to provide updates on trends, drivers, restraints, value forecasts, and opportunities for manufacturers operating in the global citrus oils market. This report discusses the overall competitive landscape of the citrus oils market. Currently, the industry is highly fragmented due to its heavily localized nature and lack of major global-level firms. This scenario is expected to change, owing to the increasing consolidation across the supply chain and emergence of several new manufacturing techniques. Various barriers in the industry are analyzed and rated on the basis of their impact on the competition levels in the market. The report analyzes the market share of the global citrus oils market on the basis of its various segments. A section of the report highlights region-wise citrus oil demand. It provides a market outlook for the projected period and sets the forecast within the context of the citrus oil ecosystem, including new technological developments as well as product offerings in the global citrus oils market. This study discusses key regional trends contributing to the growth of the citrus oils market globally, as well as analyzes the degree to which drivers are influencing the market in each region. Key regions assessed in this report include North America, Latin America, Western Europe, Eastern Europe, Asia Pacific, and the Middle East & Africa. The report begins with a market overview which includes definition, types and applications of citrus oil. The next section includes market taxonomy, demand side and supply side drivers, restraints, opportunities and trends. This report has exclusive information about the major and upcoming techniques used for oil extraction. Through a unique research methodology, Persistence Market Research provides the details about plant parts that are used for oil extraction. This report also consists of historical demand trends, citrus oils growth rate, the financial performance of top market companies, macro-economic indicators such as GDP and population data, raw material production trends, raw material trade, the influence of increasing disposable income and raw material price trend. In the final section of the report, a competitive landscape has been included to provide report audiences with a dashboard view. Key categories of providers covered in the report are citrus oil suppliers and manufacturers. Detailed profiles of the providers are also included in the scope of the report to evaluate their long-term and short-term strategies, key offerings and recent developments in the global citrus oils market. Market value and volume estimates are one of the important aspects of this report. Inputs from government databases, trade, value and volume (Import and Export) outfits, and inputs from regional manufacturers, secondary and primary sources and information obtained using the benchmarking method have been covered in this report. While giving information about data validation, regional average profitability margins have been excluded from the estimated data collected from distributors. An approximate annual consumption of end-use sectors in target geographies has been estimated while drafting this report. In addition, it is imperative to note that in an ever-fluctuating global economy, the report not only conducts forecasts in terms of CAGR but also analyzes the market on the basis of key parameters such as year-on-year (Y-o-Y) growth to understand the predictability of the market and to identify the right opportunities. Also, another key feature of this report is the analysis of all key segments in terms of absolute dollar opportunity. This is traditionally overlooked while forecasting the market. However, absolute dollar opportunity is critical in assessing the level of opportunity that a provider can look to achieve, as well as to identify potential resources from a sales and delivery perspective in the global citrus oils market. By 2017 end, revenue generated from citrus oils for food and beverages segment was estimated to be valued at more than US$ 1,000 Mn and is expected to expand at a CAGR of 5.3% over the forecast period, to be valued at more than US$ 1,693.7 Mn by the end of 2027. The segment is estimated to create absolute $ opportunity of more than US$ 61 Mn in 2018 over 2017 and incremental $ opportunity in excess of US$ 686.8 Mn between 2017 and 2027. The food and beverages segment is expected to retain its dominance in the global citrus oils market followed by the cosmetics and personal care segments. In terms of value, the CAGR of the food and beverages segment is the highest among all the application segments of the global citrus oils market. Citrus oils enjoys a major share in essential oils owing to its wide usage as industrial solvents, fragrance for cleaning products, flavoring agents, aroma and therapeutic properties. Food industry is the dominant segment where citrus oils are widely used, followed by usage in spa and massage parlors. Citrus oils are used to add sweet, refreshing flavor to beverages like tea, water, or smoothies, and enhance recipe for baked goods like scones, muffins, or cookies. Citrus oils can also be useful for adding flavor to yogurt, and to your beloved dips and salsa recipes. Citrus oils are mainly considered for using citrus oils in recipes that call for lemon, lime, orange, or tangerine zest. If the recipe calls for the zest of the entire fruit, it will likely take a few drops of essential oil to match the amount of flavor needed. Citrus essential oils are taken from the peel of the fruit—not the juice. For this reason, it is easy to substitute citrus oils for recipes that call for fruit zest, but not necessarily for recipes that call for fruit juice. Therapeutics application uses wide quantities of citrus oils, essential oils contain relatively large amounts of citrus oil. Growing consumer interest in aromatherapy directly contributes to the revenue increase in the therapeutic massage oils segment and is therefore an important driver for the growth of the global citrus oils market. The other factor is that essential oils are priced much higher than all other products in which citrus oils are included as an ingredient. This higher price is responsible for collecting huge revenues for the global citrus oils market. Aromatherapy is the use of aromatic substances for relaxation, rejuvenation, and in the treatment of certain minor physical conditions. Practitioners of this method consider that the aroma of natural, organic, and therapeutic oils can have several beneficial effects on the body. Citrus oils can be used in various ways such as in massage, bathing, shower, inhalation, perfume, and others. The globally increasing demand for therapeutic and aromatic oils is a result of the growing preference for convenient, harmless, and natural alternatives to traditional allopathic solutions. The increasing demand for therapeutic oils is also a result of the urban and sophisticated image these products carry and the historical use of therapeutic oils in several eastern countries. These products are particularly popular among women consumers in urban areas, which is creating robust development in the therapeutic massage oils segment. Citrus oils can be segmented on the basis of type which includes orange oil, bergamot oil, lemon oil, lime oil, mandarin oil and grapefruit oil. Among all these types, orange oil is readily available and the most inexpensive of all essential oils. Due to its aromatic and blending properties, and wide usage as commercial cleaners, orange oil market is expected to grow quickly in the forecast period. Citrus oils can also be segmented on the basis of application. The citrus oils finds its application in food industry, cosmetics and fragrances preparation and as therapeutic massage oils. Food industry is the leading segment in terms of usage of citrus oils as solvents due to its antibacterial and antiseptic properties and are also recognized as GRAS (Generally recognized as safe). Citrus oils such as grapefruit oils and lemon oils are intensively used for massages and skin treatment, owing to their antiseptic, antibacterial and immune stimulating properties. Geographically, Western Europe is expected to be the largest market in terms of value for citrus oils, owing to increasing consumer sophistication, demand for natural cosmetics, fragrance, beauty products and medicines. Among the countries, Germany is expected to remain major markets in terms of consumptions for citrus oils followed by Spain. North America is expected to be the second largest market for the citrus oils in terms of consumption, being a developed nations the consumers are more sophisticated compared to consumers in other parts of the world. U.S. is expected to drive the growth and also regarded as major importers of citrus oils. 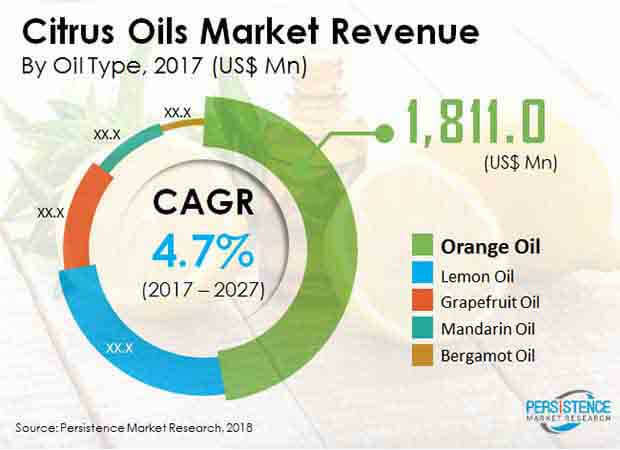 Asia Pacific is expected to grow rapidly and expected to be the fastest growing region for citrus oils owning increasing in demand of citrus oils in food industry across the region followed by the demand from the growing number spas and massage parlors and less regulative conditions.